Last week people couldn’t get enough of the Garbage Pail Kids version of the presidential candidates. 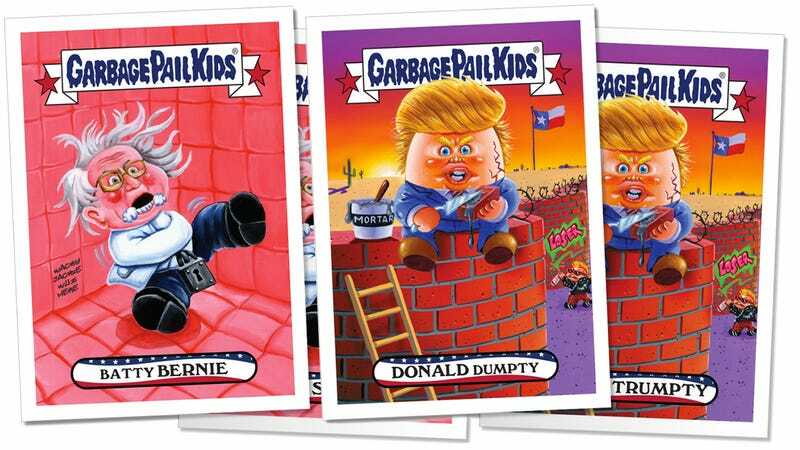 And now Topps has introduced nine brand new versions of their political cards, including Donald Dumpty, Batty Bernie, and “Texan” Ted. Donald appears to be building a wall on the Mexican border, while Bernie is locked in a padded room and foaming at the mouth. The scare quotes around “Texan” for the Texan Ted card are a jab at the fact that Ted Cruz was born in Canada. Maple syrup, Mountie costume, and hockey gear aside, the most insulting thing about the Cruz card might be his button. It reads, “I Heart Bieber,” a nod to fellow Canadian, Justin Bieber. There’s also Misspent Marco, Dead Jeb, Brutal Ben, Crass Chris, Jumped Ship John, and Billary Hillary — a card with Hillary Clinton emerging from a Bill Clinton costume. These limited edition cards are only available from Topps for 24 hours, so scoop them up fast if you’re a fan of Garbage Pail political satire.